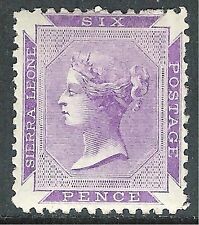 Sierra Leone 1872 reddish-violet 6d lightly mounted mint SG3.excellent for this rare stamp. 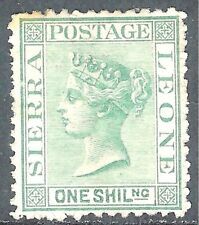 Sierra Leone 1872 green 1/- perf 12.5 crown CC sideways mounted mint SG10 no gum but rare stamp Cat £500 plus. 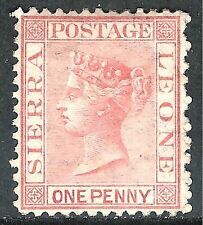 Sierra Leone 1872 rose-red 1d perf 12.5 crown CC sideways lightly mounted mint SG7. 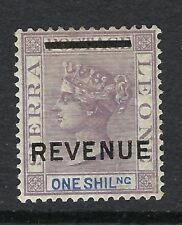 Sierra Leone 1908 SG 106 m/mint. 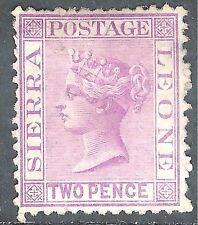 SIERRA LEONE Queen Victoria 1s. Mauve & Blue Overprinted REVENUE MINT see scans. Emartenetwwa emartenetwr emartenetpw emartenets emartenet.